Hamlette at Hamlette's Soliloquy is hosting I Love Austen Week this week - a week dedicated to all things Jane Austen! Be sure to check out the festivities here if you feel so inclined. Here are my answers to the week's tag. My first proper experience with Jane Austen was the 2005 Pride & Prejudice film. I didn't know much about the story beforehand and wasn't quite sure what to expect, but I LOVED it. So I quickly started searching out other film adaptations, and of course the books themselves. I think I had seen at least one film version of each book before reading it. 2. What is your favourite Austen book? Until a few days ago I would have said Sense & Sensibility, but I've recently started rereading Pride & Prejudice and suspect that it is about to take over. There are just so many good bits that I'd forgotten! 3. Favourite heroine? Why do you like her best? This is quite a hard question! I think Elinor, Anne and Jane are the ones I would most like to know in real life. But I like all of them (except maybe Emma, but I like her character arc through the story). 4. Favourite hero? Why do you like him best? I really like Colonel Brandon (especially Alan Rickman's version). He's just a really nice guy :) Although again, I find it difficult to pick a favourite. 5. Do you have a favourite film adaptation of Austen's work? No, although I do have a very nice boxed set of all of her novels. I would like someone to make a good, accurate version of Mansfield Park. I'm not sure about casting though - I don't think I know enough actors to make an informed decision. 10. 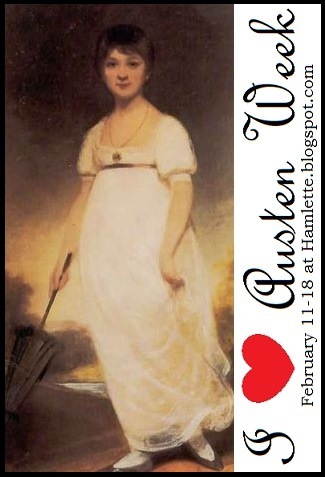 Share up to five favourite Jane Austen quotations! Oh I too love Colonel Brandon! I think that does bias to me towards the '05 version, especially as it was my first introduction to the story. Also sometimes I want to revisit the story but don't necessarily have five hours to devote to it :) I do like both versions a lot though. Colonel Brandon is wonderful. I would marry him. Such a solid, kind, caring man. And Alan Rickman did such an amazing job of portraying the pain Brandon has carried with him all these years, and showing how Marianne helps heal him. I love both the '95 and '05 P&P movies too! They both have so much to offer. I really like Alan Rickman's portrayal of Colonel Brandon. I think the casting in general for that film is very good. That is one of my favorite quotes from S&S; really the entire conversation about the dead leaves makes me smile. I remember one in Mansfield park as well, where Fanny starts quoting poetry when she hears someone may be cutting down an avenue. So much passion for trees and leaves, lol. And yes, I think both versions of P&P have things to offer; I like that the 1995 version gives a more complete version of the story, but sometimes I don't want to sit through all 6 hours of it (or don't have time to).